Figure A18. Bitterroot anomaly, interpreted as the Bitterroot slab, with (horizontal) [vertical] cross sections through (A)[D] the UUP07 p-wave) and (B)[D] the combined SL2013 and S40RTS s-wave models at 470 km; C) the location of the modern geological record that we interpret to have formed during the subduction of the slab. The Bitterroot anomaly (Figure A18) is detached and located in the upper mantle below western North America, and is hook-shaped at a depth of ~200 km. In tomographic studies it has been imaged to depths of 230-600 km (Schmandt and Humphreys, 2011). Its distal position relative to the trench has recently been interpreted as the result of flat-slab subduction, which may be correlated to the geological record that shows the accretion of the Siletzia micro-continent to North America starting at ~60 Ma (Schmandt and Humphreys, 2011). Following this accretion, regular subduction at the Cascadia subduction zone (see Juan de Fuca slab) led to arc volcanism in Oregon and Washington beginning ca. 45–40 Ma (Schmandt and Humphreys, 2011; Wells and McCaffrey, 2013). 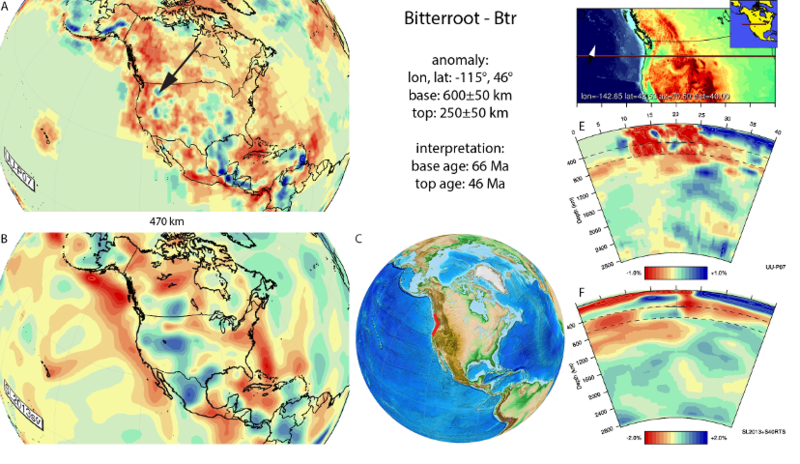 The volcanic arc associated with the Bitterroot subduction we interpret to be the Challis-Absaroka arc, extending nearly 1000 km into the present-day Laurentian continental interior and located above the Bitteroot anomaly. The age of this arc is ~55-45 Ma (Humphreys 2009). Recently the volcanics were dated by U-Pb geochronology by Gaschnig et al. (2017) and we interpret the Bitterroot peraluminios suite (66-53 Ma) and Challis intrusives (~50-46 Ma) to have resulted from subduction of the slab. We therefore adopt 66 Ma as start of subduction and 46 Ma as end of subduction leading to the formation of the Bitterroot slab.